Tim Bradbury/Getty ImagesSimone Biles swept every event at the national championships over the weekend, showing no signs of rust after stepping away from competition for almost two years. 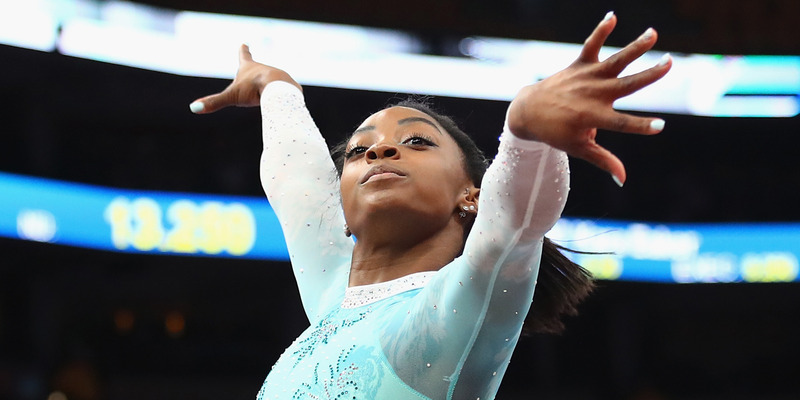 Simone Biles dominated in her return to the national championships over the weekend. Biles took gold in the all-around and every individual event, becoming the first woman to accomplish such a sweep since 1994. With the win, Biles is set to lead Team USA into the world championships in October. Simone Biles is back and still one of the most dominant athletes alive. At the national championships over the weekend, Biles made clear that she hadn’t lost a step after a nearly two-year break from competition since the 2016 Olympics, taking gold on vault, uneven bars, balance beam, floor exercise, and unsurprisingly, in the all-around. The sweep was a career feat for Biles, who became the first woman since Dominique Dawes in 1994 to take gold in every event. With her all-around gold, Biles became just the second woman ever to win nationals five times. While Biles’ 2016 Olympic run was one of the most compelling American sports have seen – taking home five medals, four of them gold – her return to the sport has the potential to be even more impressive. Few athletes can come back after two years away from competition and jump right back into action against the best in the world, but Biles did just that. Biles admitted that she wasn’t sure heading into the competition how her comeback would play out. With the win, Biles is set to lead Team USA into the world championships in October. While there’s still a long road ahead before the 2020 Olympics, Biles appears to be ready to continue her reign at the top of the gymnastics world.